We are always craving Mexican food! To keep our cravings satisfied & our waistlines happy, we are constantly creating new recipes that are easy, healthy and delicious. Tonight we are whipping up our Mexican chop salad and boy is this one a winner! 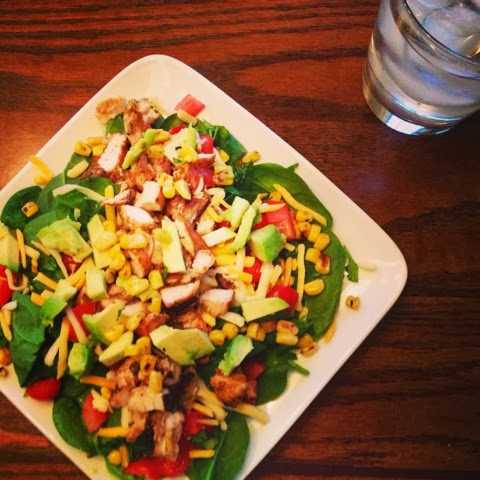 This salad is a colorful chopped combination of organic baby spinach, grilled corn, vine ripe tomatoes, avocado, grilled chicken, shredded cheddar cheese and topped with fresh cilantro. We drizzle this with our homemade fruity mango vinaigrette. This dressing is SO good it actually gets the hubs requesting salad night! 1. To make dressing, add diced fresh mango, orange juice, vinegar and olive oil to blender. Season with garlic, onion, brown sugar, salt & pepper. Add in fresh chopped cilantro & blend until smooth. 2. Heat grill pan to medium high heat and add olive oil. Season chicken with salt & pepper and grill on each side (4-5 minutes) until cooked through. Remove chicken, dice and set aside. 3. Add corn to pan and grill 2-3 minutes until browned. 4. Dice tomato & avocado and finely chop cilantro. 5. 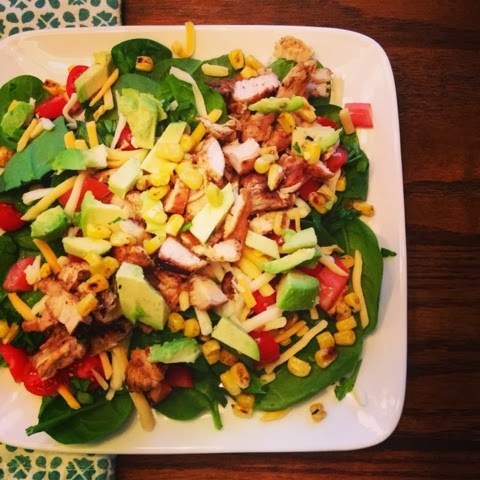 Plate up baby spinach and layer on tomato, grilled corn, avocado, chicken and top with cheddar cheese. 6. Drizzle on 2 tbsp of homemade dressing & enjoy!